Contrary to conventional wisdom, the cut of a diamond does not describe its shape. 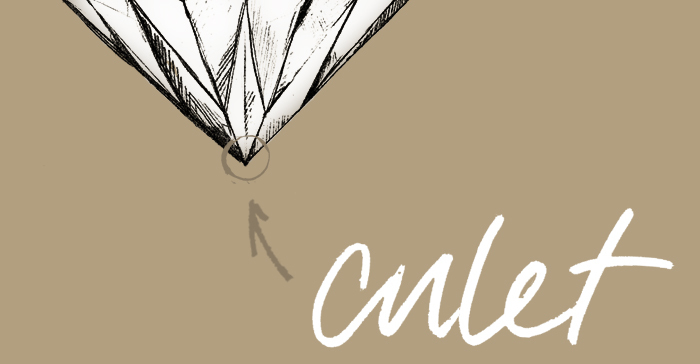 Though it is common to refer to a stone as “round cut” for example, there’s much more to the meaning of “cut.” Here, we’ll answer all the questions you might have about evaluating diamond cut and what all those grades on certification paperwork actually mean. So, what is diamond cut? The term refers to how the diamond is faceted and proportioned to return light to the eye—in other words, how sparkly a diamond appears. Each stone is graded on its cut ranging from Ideal (perfect) to Poor (not desirable). What is the diameter of a diamond? Diamond diameter has to do with the diamond’s size. It is measured in millimeters (mm) and converted into carat weight. For example, a 1.03 carat Ideal Cut stone is 6.5mm in diameter. However, the depth of a diamond cut can affect the millimeter-to-carat-weight conversion. What is the diamond depth? The depth measures the height of the diamond from the table (top) to culet (bottom point). A stone that is cut too deep will have a smaller-than-Ideal diameter, while a shallow depth will make the diameter larger. Neither of these are desirable, since this changes how light bounces within the facets and affects how sparkly the diamond looks. What is a diamond’s depth percentage? Depth is generally expressed as a percentage on a diamond certification report. This percentage shows the relationship between a diamond’s depth and width of the girdle. 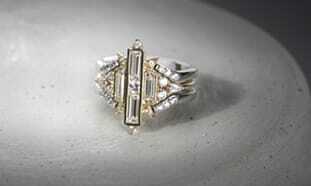 The diamond girdle is the widest part of the diamond when you’re looking down on a stone. From the side, it is the thin area between the crown and the pavilion. 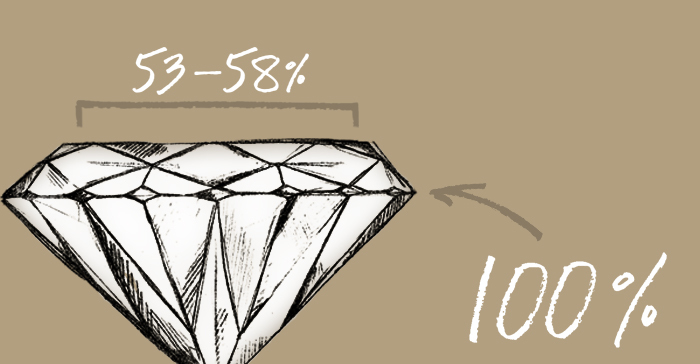 What is the ideal diamond depth percentage? Generally, an ideal depth percentage is between 59 and 62%. However, very good cut diamonds may have depth percentages slightly outside this range. 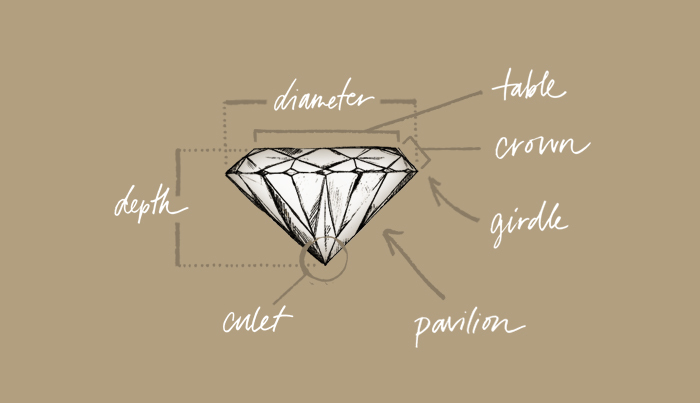 What is a diamond table? The table is the flat facet at the top of the diamond. It’s what you typically at when you look down at a diamond. It’s important because it is the main entry point for light to enter and refract within the facets of the diamond. What is a diamond’s table percentage? The diamond table size is shown as a percentage on its certification paperwork. This is the relationship between the table and the diameter of the girdle. So, a round diamond with a 55% table percentage means that the table is 55% as wide as the girdle. What is the ideal diamond table percentage? Generally, an ideal table percentage is between 53 and 58%. However, very good cut diamonds may have table percentages slightly outside this range. 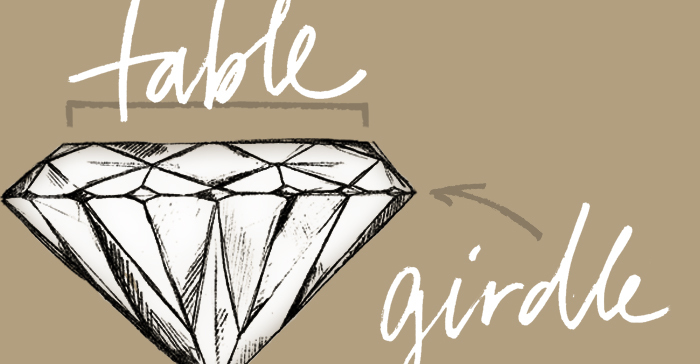 What’s the ideal diamond girdle thickness? On your paperwork, the diamond girdle is graded on a range from extremely thin to extremely thick. Too thin, and a diamond is at risk of chipping; too thick, and the carat weight has not been maximized so the stone will appear smaller than its carat weight suggests. For a typical round cut stone, a medium to slightly thick girdle is ideal. Some stone shapes with pointed edges, such as marquise or pear, are generally cut to have thicker girdles to increase the durability of the stone against chipping. What is the crown of a diamond? The diamond crown is the angled section between the table and the girdle. It plays a significant role in light return, which affects sparkle. What is the best crown height percentage of a diamond? 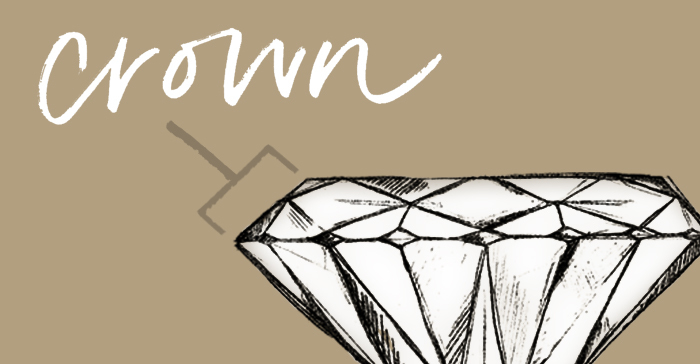 The crown height is shown as a percentage on a diamond’s certification paperwork. This measures the relationship of the crown height to the girdle diameter. The ideal height is about 15-16.2%, though very good cut diamonds may fall slightly outside this range. 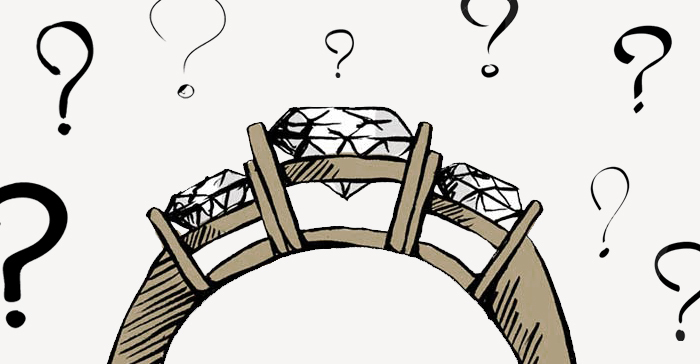 What is the crown angle of a diamond? This measures the angle of the diamond between the table and the girdle. Generally, a very good cut diamond will have a crown angle between 33 to 35 degrees. What is the diamond pavilion? The diamond pavilion is the section from the girdle to the culet. The pavilion should not be too deep or too shallow, or light will escape through the sides rather than returning to the eye—greatly diminishing sparkle. 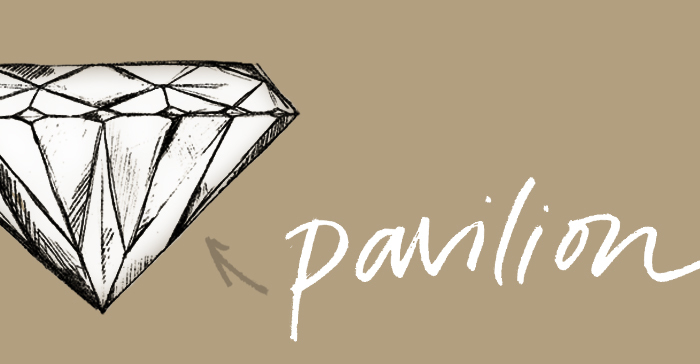 What is the ideal diamond pavilion percentage? Generally, the ideal diamond pavilion percentage is 42.5-43.5%. This measures the relationship between the pavilion depth and the diameter of the girdle. What is the ideal diamond pavilion angle? The pavilion angle is measured in relationship to the table. An ideal pavilion angle is between 40.5 and 41 degrees. However, a very good cut diamond may fall slightly outside this range. What is the diamond culet? The diamond culet is the very bottom of the pavilion. It is either a point or a very small facet. 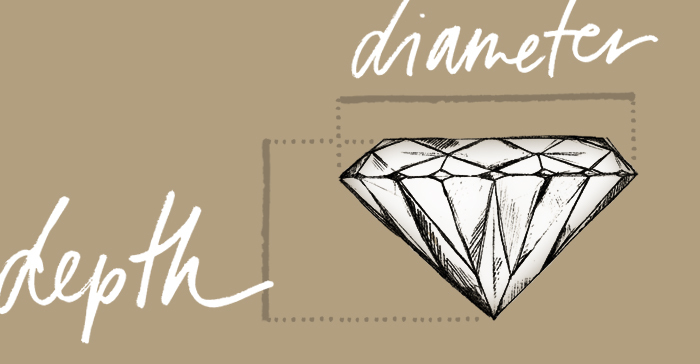 What are the most important measurements in a diamond cut? Each of these measurements is important in creating the proportions for Ideal Cut diamonds with maximum sparkle. The good news? You don’t have to become an expert. The best way to find a well-cut diamond is to check the overall diamond cut grade on the certification paperwork. This will tell you how well the diamond was cut, and how sparkly it will be. Ideal, Excellent and Very Good cut diamonds are the top grades, while Good cut diamonds are a decent value choice. For engagement rings, Fair or Poor cut grades should be avoided. A note: Forever Artisans works with two types of man made stones. Contemporary Nexus Diamonds™ are heirloom quality diamond simulants; each of these is Ideal Cut, no matter the shape or carat weight. True Grown Diamonds™ are man made diamonds, exactly the same as mined diamonds. Therefore, like mined diamonds, these are graded within the range of cut quality. Thanks so much for this valuable information. I appreciate proper terminology.